What makes this two-disk release rise above the abundance of archive releases by heavy metal legends Deep Purple? 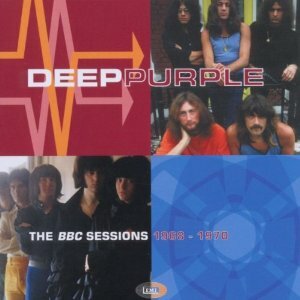 BBC Sessions 1968-1970 has rare live recordings featuring Purple’s first (and best) singer, Rod Evans. So little has survived from Deep Purple’s Mark I period with Evans, that this is no less than the equivalent of a sonic Holy Grail for fans. Evans’ suave, soulful vocals turned Purple’s remake of Joe South’s “Hush” into one of their signature tunes. On Sessions “Hush” gets two live treatments, the first a dead-on take with guitarist Ritchie Blackmore who is more concise and creative than on the original and Nick Simper’s funky bass lines, which are more evident. The second finds the band looser and in a more experimental mode. “The Painter” is also served up twice. Evans’ sedate style gets off to a rocky start in the fast-paced first version, so much so it should have been called “the panter,” but the slower second take suits his crooning style and Blackmore stays more focused on creating rhythmic tension. Evans and Simper were ousted in a nasty coup that saw them replaced without their knowledge by leather-lunged singer Ian Gillan and invisible bassist Roger Glover, both of whom are represented on the second CD. Much of the material stems from Purple’s 1970 album In Rock. Gillan lacks Evans’ finesse and sense of melodic style, but makes liberal use of his trademark skull-splitting scream. Purple may have lost a great vocalist, but the switch to a heavier style allowed Blackmore to stretch out, as evidenced by the instrumental “Grabsplatter” on which he sounds particularly caffeinated and Ian Paice plays his drums like John Henry pounding railroad ties. The Gillan material on BBC Sessions is not on par with Machine Head or even Who Do We Think We Are, but does illustrate the deafening power of his voice as a weapon of mass destruction. The songs on the first disk show that Purple could successfully mix multiple genres and that Rod Evans was one of rock’s most underrated singers.